Juan Angel Chavez, Vida simple, 2004. Glass, stone and granite mosaics with screen printed and painted glass insets, 9 ft. x 25 ft. x 4 in. (274.3 x 762 x 10.16 cm.) Damen Station, CTA Arts in Transit Program. Photo Olga U. Herrera. ©Juan Angel Chávez. Juan Angel Chávez and Corinne D. Peterson, Hopes and Dreams, 2001. 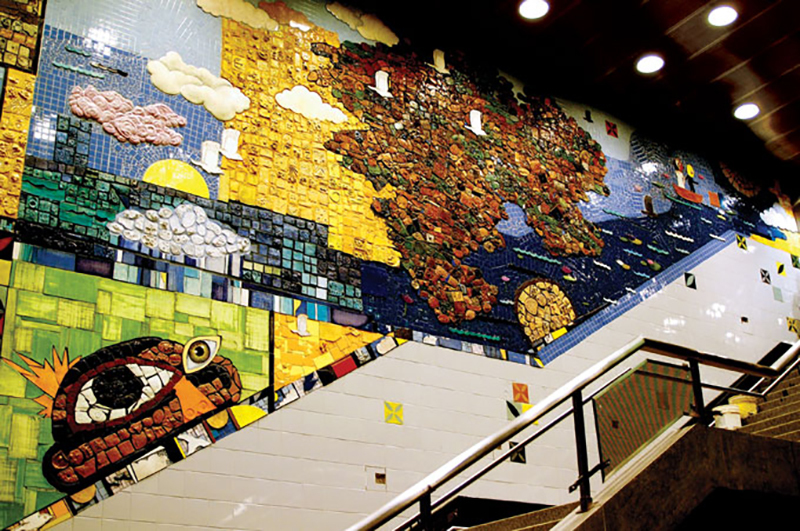 Glass ceramic mosaic, CTA Roosevelt Station, CTA Arts in Transit Program. Photo courtesy of the Chicago Transit Authority CTA and the artist. ©Juan Angel Chávez. Juan Angel Chavez, Vida simple, 2004. Detail. Glass, stone and granite mosaics with screen printed and painted glass insets, 9 ft. x 25 ft. x 4 in. (274.3 x 762 x 10.16 cm.) 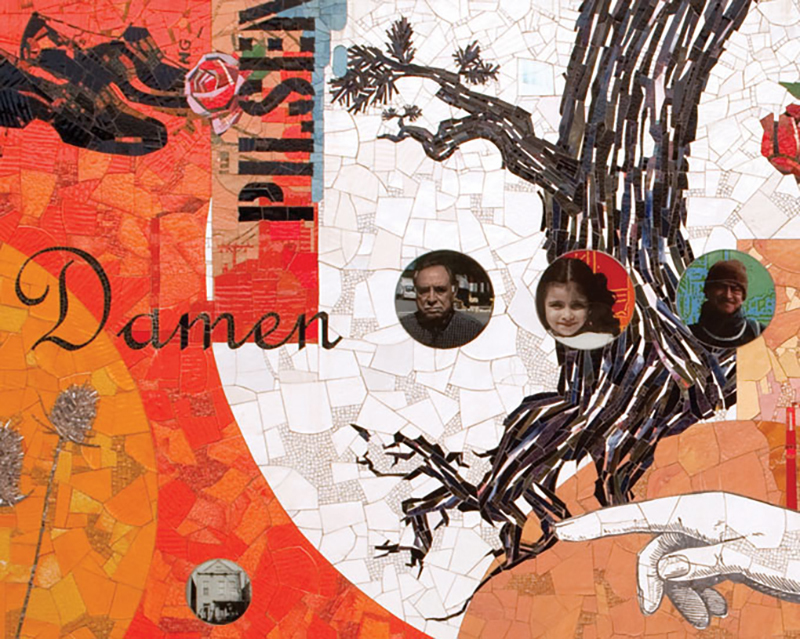 Damen Station, CTA Arts in Transit Program. Photo courtesy of the Chicago Transit Authority CTA and the artist. ©Juan Angel Chávez. Born in 1971 in La Junta, Chihuahua, Mexico, Juan Angel Chávez settled with his family in uptown Chicago at age 13. Experiencing the difficulties of teenage years and a new country, before long he found skateboarding as a fun way to experience the vibrant urban space in a city known for its parks and public art. Encouraged by his mother and teachers to take art lessons, while in high school he attended the School of the Art Institute of Chicago’s (SAIC) Early College Program. Although he enrolled in SAIC as an undergraduate, soon he joined the National Museum of Mexican Art and became interested in community public art. In the process, he also became acquainted with a creative ensemble of DJs, graphic designers and graffiti artists. 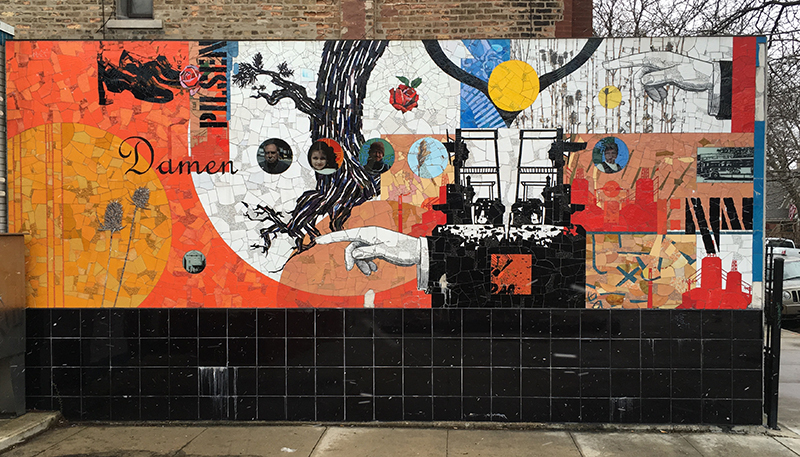 Immersed in a budding early career as a muralist, Chávez assisted with and executed a series of murals, both with the Chicago Public Art Group and individually. These murals attest to his creativity, superb design, technique and craft, such as in the murals as Changing Home (1996) in Chinatown; Fellows and Others (1997) with Olivia Gude; Love Mural (2001) with Rob Moriarty and Chris Silva; What We See (2001); and the ceramic mosaics Hopes and Dreams (2001) with Corinne Peterson at the Roosevelt CTA Station, and Vida Simple (2004) at the Damen CTA Station. He started experimenting with street sculptural relief installations on boarded up buildings such as Giant (1999), which caught the attention of the art world. In 2003, Juan Angel Chávez won the Richard H. Driehaus Foundation’s Individual Artist Award. Shifting his attention to sculpture and installation art, he has developed a series of well-received projects such as The Speaker Project (2007), Neptuno (2011), and Scraping the Bowl (2012), among others. Chávez is the recipient of various awards including the Louis Comfort Tiffany Award, the Joan Mitchell Foundation Award for Painters and Sculptors and the Joyce Award.